Aztek Maiden - Flashy 2000 Paint Mare! ''Mila'' is a very pretty and smart mare and is ready to go your way. She has the potential for eventing, hunter-jumper, and dressage. With her half TB blood, she is very leggy and athletic. Under saddle since June 2003. 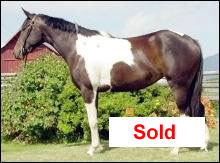 Has been used to work cows, has been on trails, has had arena work and has been started over 2' to 2'6'' courses. "Mila" has many champions in her pedigree.